On one side is a strong and vibrant Church–including one of the largest mega churches in the nation–Lakewood Church, pastored by Joel Osteen. Though partially flooded by Harvey, Lakewood is now open as a distribution center for helping displaced residents. The Houston Area Pastors Council is also one of the most vibrant and active in the nation, unifying God’s people to reach out to others in the Name of Jesus. I know many wonderful spiritual leaders in the Houston area–including some current students. On the other side is a rabidly progressive government, formerly led by the city’s first lesbian mayor who threatened to subpoena pastor’s sermons in 2014–labelling them hate speech. She also helped lead the fight for genderless bathrooms in the nation–an ill-advised secular idea. 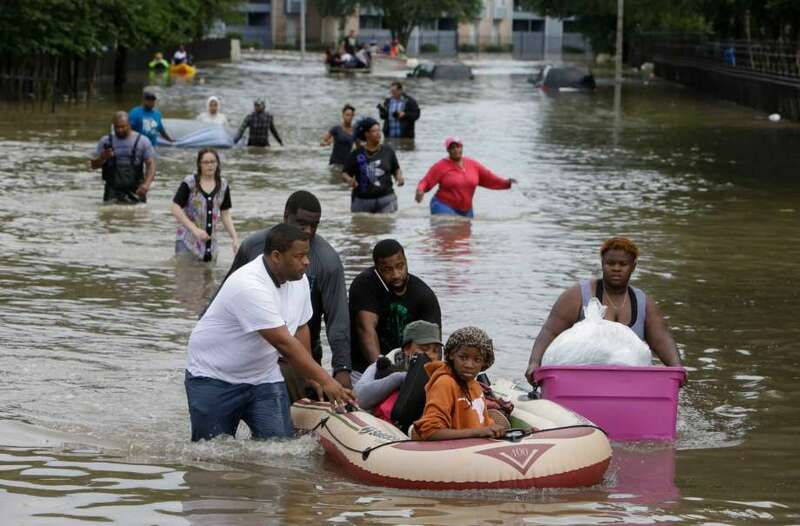 Houston’s current mayor, Sylvester Turner, is widely criticized for not encouraging residents to evacuate the city. So, faith in God and radical secularism are both vying for the soul of Houston. How will the devastation of Harvey affect that battle? Here’s my view on the messages from Houston. First, we must admit that analyzing natural disasters is a subjective business. We can error on one of two sides: 1) That we know this was an act of God to judge the residents of the area, or 2) It was only a natural phenomenon, and we need to clean it up and move on. Believers in God make the first error when we rationalize everything through the lens of justice. Secularists commit the second error when they pretend there’s no God and that humans can save us. There’s a better understanding: God either causes or uses all events to bring individuals and nations into right relationship with Him–if we listen to His messages. In the book of Revelation, the Bible describes a future when God will judge evil on earth with natural catastrophes and supernatural signs. The result is stated in Revelation 16:9, “They cursed the name of God who sent all these plagues. They did not change and give him glory” (New Living Translation). It seems strange that people wouldn’t confess their faults when faced with the power of nature’s God. The politically correct (secular) view of natural disasters is that God is not involved in the calamity–only (maybe) in the relief efforts. How do they know? Why is there such a strong aversion to considering that God could be a part of the natural disaster? Here’s why. Secularists want to convince the world that there is no God–that they are the ultimate authorities and their forms of human government, including humanitarian relief, are the main things that should be trusted and appreciated. The atheistic interpretation of reality instructs people that there is no God, no such thing as sin and thus no wrongs to be righted. From that vantage point a future Revelation 16:9 taking place in an atheist dominated world makes total sense. No God–no repentance–even when it’s the smart thing to consider. But what are the greater realities behind natural disasters and environmental catastrophes that we experience on earth, including Hurricane Harvey? The Bible is clear that the loving God of the Universe uses weather and other phenomena as a means of discipline and life change. In the 8th century B.C., God brought a vision through the prophet Amos “two years before the earthquake” (Amos 1:1) during the reign of King Uzziah that spoke of the land being shaken by God (8:8), houses being smashed (6:11), altars being cracked (3:14) and even the Temple at Bethel being struck and collapsing (9:1). The prophets said for centuries that God used famines, natural disasters, and invading armies to bring people to repentance. This is why insurance companies categorize natural disasters as “acts of God.” As C.S. Lewis stated: “Judgment is a severe form of mercy.” Isaiah said this: “When the earth experiences Your judgments the inhabitants of the world learn righteousness” (Is. 26:9). When we don’t listen to God, he uses other means to get our attention. The goal is our good– through changed lives and hope for the future. The Bible also records that the devil, Lucifer or Satan, has some delegated powers to bring physical calamities upon people. His goal is to destroy people. This was the case of the trials of Job whom God allowed Satan to test Job’s character (Job 1:12-19). In this particular story, fire, invading tribes, and violent winds were used by the enemy to test and impoverish Job. God used Satan’s evil physical testings to bring Job to humble change, actually expand his prosperity (42:5-10). We also know that we live in a fallen world where accidents, both of man and nature, happen to people. The world is no longer a Paradise, but one where “the whole creation groans and travails in childbirth” until it is set free from its fallenness (Romans 8:18-30). Many of the physical disasters and calamities we face may not be the direct hand of God or Satan, but simply the fruits of a fallen and imperfect world that are allowed by the Creator. This possibility involves God, but stresses man’s part in the curse of creation. None of this scenario is God’s fault. It’s the direct result of man’s sin. So why did Hurricane Harvey visit the Gulf Coast these past few days? We don’t know for sure, but it clearly could have been an act of God, or was influenced by Satan, or simply involved fallen creation, and/or was a direct result of people’s sins. We have to be careful in our assessments. But let’s not deny that God and supernatural forces could have been involved. It would be helpful for all Americans, including the people of southern Texas and nearby Louisiana who were devastated by the storm, to seek the face of God for the reasons for this misfortune. In response to their seeking, God just might use this terrible tragedy to bring renewal to them–and us. Turn back to our Creator and Savior in humility and prayer. Realize how vulnerable we and every nation are before nature’s God. Reject the toxic political environment of the past year and throw ourselves into uniting our nation through compassion, acts of service, and helping the people of Houston rebuild their homes and lives. Wake up to the reality that we may be facing large-scale political, social and financial upheaval if we do not experience revival as a nation, under God. The message is loud and clear: “Houston (and all of America), there’s a problem.” Answer: “There’s a solution through faith in Jesus Christ and supporting each other with His love and compassion. Yes, He is the final Controller and the only One who can bring great good out of suffering. The enemy even may attack at times through weather (think Job), but God turned it for good. That's because, He is Good! It is good that mentioned both God and the devil can bring storms. So far we have not had to cancel any meetings!